In a city long at conflict with itself, Jarrod Bell runs the only operating CrossFit affiliate because, he says, it’s the right thing to do. Andréa Maria Cecil reports. 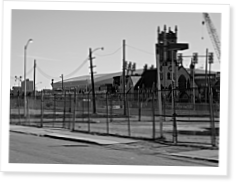 The 400 m surrounding Detroit’s first and only operating CrossFit affiliate is a microcosm of the city’s decay. There are overgrown lots—a couple outlined with rusted chain-link fences forbidding the curious—and abandoned turn-of-the-century Victorian-style brick homes whose vine-covered walls, broken windows, “No Trespassing” signs and unkempt grounds seem suited for a horror film. Beyond that immediate radius are vacant buildings of all heights—some boarded up, others with broken windows, all with graffiti. One 14-story building warns “Zombieland” in thick black letters across the top. Most wouldn’t choose this place as the ideal location for a small business. Or any business. Detroit’s cruel tagline, Renaissance City, has mocked its reality for the better part of 60 years. It’s a town characterized by empty parcels of untrimmed grass, burnt shells of homes left vacant and roaming packs of emaciated dogs—coyotes, at one point. The 313-year-old city is proudly known as the birthplace of Henry Ford’s first automobile, Motown and techno music. For decades it’s struggled with deep-seated racial tension, high crime rates, government corruption, strapped finances and a dwindling population. In March, Michigan Gov. Rick Snyder declared a financial emergency in the city and appointed an emergency mayor. Four months later, Detroit became the largest municipality in U.S. history to file for bankruptcy. Total sum: $18.5 billion. Yet when Jarrod Bell decided to move CrossFit Benchmark Workouts (BMW) out of the trendy suburb of Royal Oak in 2012, he chose Detroit. “At that time, the community centers in Detroit were closing. There was a need, there was a fit, something I could bring to the table,” the 48-year-old said. Video: Gold Behind Those Clouds by Mike Koslap. CrossFit King of Prussia finds success with SAT-prep program. He arrived a shy teenager. Skinny, hunched over, head hung, knees caving. Cool write-up Andrea. I'm so glad Jarrod is getting some publicity. The story is just beginning. I can't wait to see how things turn out at his new location. I also wrote an editorial on our site detailing how we met and how he helped us out. You can see it here. Hats off to you Jarrod, the world needs more people like you!